Framed or canvas in 3 sizes. 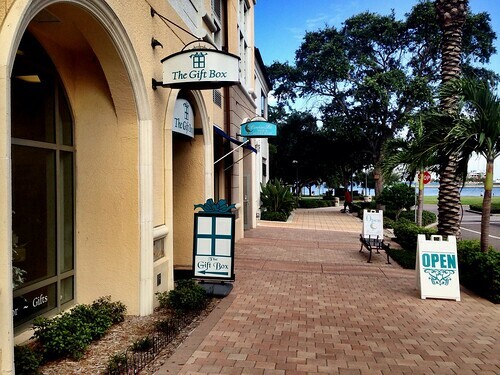 The walk to the St. Petersburg Pier offers stunning views across the Vinoy Basin of the Vinoy® Renaissance St. Petersburg Resort & Golf Club and its private marina. 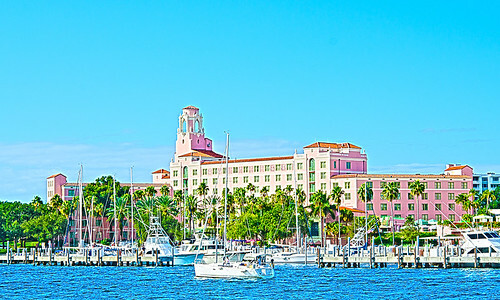 The Vinoy's pink tower glistens in the sun just above palm tree lined streets along the basin. From here, you can watch the sailboats and powerboats navigate their way. View the image. 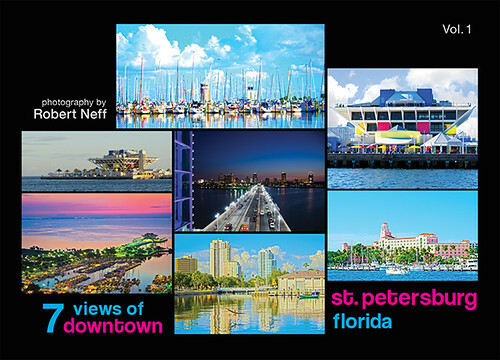 From Albert Whitted Park, you have a panoramic view of downtown St Petersburg. 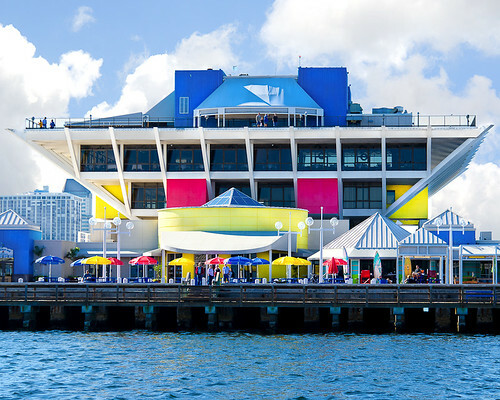 Your eyes will move across the Mahaffey Theater Basin to the Sailing Center at Demens Landing and then follow the palm tree-lined Bayshore Drive to scan the city's skyline. Occasionally, pelicans will interrupt your focus so you may watch them fly over the water in search of their next meal. View the image. 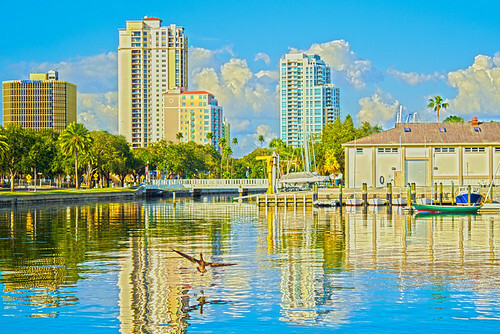 Vinoy Park is on the north side of downtown St. Petersburg and offers vista views of Tampa Bay and the St. Petersburg Pier's inverted pyramid and it's pylons. View the image. 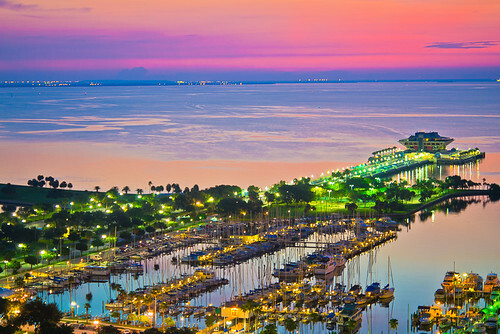 While there are many locations to enjoy the sunrise over Tampa Bay, the upper floors of the tallest building in St. Petersburg provides unique perspectives of the horizon, marinas and pier. One Progress Energy Plaza has a breathtaking outdoor patio to watch the colors change. View the image. The top floor of the St. Petersburg Pier is the best location to watch the sun set behind the city's skyline. The skyscrapers work with the setting sun to dazzle the mind with a vibrant display of colors. 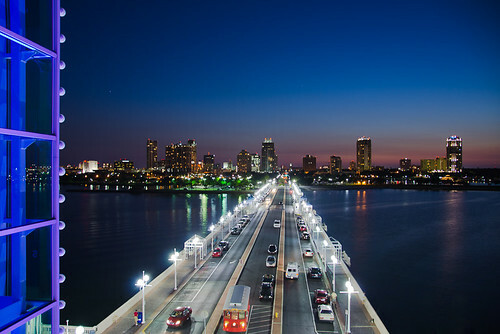 As the sky turns to dusk, you have bird's eye view of the Pier color changes, especially when the lights on the elevator's steel structure change color. View the image. 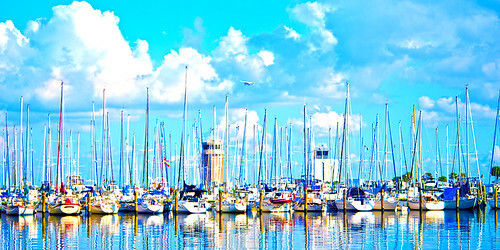 The St. Petersburg Pier extends into Tampa Bay and provides a great view of the sailboat races or boats entering the basin on either side. Sailing by the Pier provides a water-level view of the fishing docks, the pier and people enjoying the restaurants and views. View the image. The southern end of Bayshore Drive follows the Mahaffey Theater Basin with unobstructed views of the sailboat marina at Demens Landing. Behind the masts are Albert Whitted Airport's towers set against storm formations rolling up Tampa Bay. Occasionally you may catch a small airplane scaling the clouds of St. Petersburg Marina's South Dock. View the image.